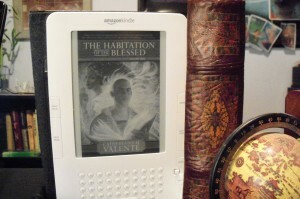 I had originally hoped to have finished reading Catherynne M. Valente’s Habitation of the Blessed: a Dirge for Prester John, Volume 1 by today, so that I could write a review that addressed the whole of it, coming to some grand, deep conclusion — so that I could write, in fact, both intelligently and beautifully about this intelligent and beautiful book. However, I find that Thursday has arrived, and I have not yet reached the end of the book — and that is, I believe, a very good thing in this case. I could have rushed it, of course I could have — like most readers who love reading, I can read very quickly indeed. But earlier, over in the comments, Sabine made this point : It’s one of those books, like Gormenghast, that forces me to read slowly and savor the prose. But I also have to stop reading after a chapter or so, just to cool down my brain. If you try to read Habitation of the Blessed quickly, you’re making a big mistake. A couple of times over the past few days, I did start to hurry, hoping to finish by today. But each time some wiser part of myself stepped forward, grabbed me by the elbows, and shook me hard. Stop, it said. Go back. Read it again. Look what you missed! I soon stopped trying to rush. Because if you read a story very quickly, what you get from the story is this: the events. That’s it. The stuff that happened. That’s all. For some writers, that’s all they have; and for some stories, that’s enough. So in reading them fast, you lose nothing — and even gain, perhaps, in the giddy glee of sheer speed. But Valente has more for you. She’ll give you what happened, but also the scent of it; and the cracking of blue light above; and the sorrow and joy of layered centuries; and delight, and the taste of especially good coffee; and the pain of remembered betrayal by someone who you didn’t know yet. Life is not just events; it’s resonances and echoes, and knife-edged immediacy. It takes more than plain prose to give these things to the reader. I am a very bad historian, the monk Hiob says. But I am a very good miserable old man. I sit at the end of the world, close enough to see my shriveled old legs hang over the bony ridge of it. I came so far for gold and light and a story the size of the sky. I am a Pentexoran, Hagia the Blemmyae says. I am a loyal and darling child of luck. I submit to it, like a dog. But it terrifies me, sometimes, how near we come, every moment, to living some other life beyond imagining. I ate the sail one night and dreamed of honey, the starving traveler John says. The stars overhead hissed at me like cats. I am not like you, Imtithal the Panoti says. I was made of other things than street-dust and spices, other things than cities can forge in their endless and wending hearts. These are the four characters Valente gives us, to usher us into and through the Habitation of the Blessed: two men of the world we know; two women of the world of wild wonder. They’ve led me halfway through the book thus far. I’m rested now; my brain has cooled down a bit. I’m ready for more. This entry was posted on Thursday, October 28th, 2010 at 10:13 pm. You can follow any responses to this entry through the RSS 2.0 feed. Both comments and pings are currently closed. Since we have not all finished reading this book, how shall we avoid spoilers? Well, there will be spoilers, to some degree. It’s really inevitable. But we can try to avoid major plot-points. And it might help if we mentioned how far we are into the book each time we make our comment. That said: I am at this point almost excatly halfway through — 52% according to my Kindle (location 2312 if that helps). I notice that the Kindle version does not list chapter numbers in the table of contents! Can anyone tell me, is this different from the printed verson? Ok, a few thoughts. I think they’re non-spoilers. But for the record, I am now 50% of the way through the book. Ok, she’s not really like that. But she brings up resonances of those three authors as I read this book. I love the inventiveness, the cleverly told tales, the voices of the four narrators, the complex and unusual population of Pentexore, and the details of the society. So far through the book, I would love to really meet three of them. Not John, though. Not yet at least. For me, he’s the least interesting of the main characters. But yet, because of what the other characters say about what he does or will do, I’m still gripped by his narration as well. A letter-writer to some show on NPR a few days ago used the phrase “how we create ourselves from our memories” or something like that. This book deals in myths and legends, so part of the enjoyment I get comes from comparing others’ memories of John with his own words. Also, in comparing Hagia and John’s own words with the later legend. Now I’m going to go read some more. I’m now 73% through, location 3269…. LeGuin — Stories as a way of understanding a culture, as in Always Coming Home, now that you point her out to me. I hadn’t thought of that before. But also, of course, A Wizard of Earthsea. And the stranger coming into a strange culture and finding it incomprehensible but learning better, as in The Left Hand of Darkness. China Mieville — Yes, but I think that the resemblance there is more cosmetic than deep. He does have wild sights, and uses wild language, which Valente also does, but differently. But where they most resemble each other is that they’ve each adjusted the language to “embody what it indicates”, as in the Houseman quote, above. Neil Gaiman — Yes, but not in the obvious way… well, actually, in the obvious way too, but the less obvious way is much more interesting. And I want to expand on that, but oops! Have to get to the library before the bookstore closes, so I’ll expand on it later. Not wishing to leave you on a cliff-hanger here, but the bookstore closes at 2PM. And I have to put on, you know, clothes. Else society would object. So, continuing my previous thought…. But there is something that Gaiman and Valente seem to share — and by the way, I also find it in Jonathan Carroll’s work. But this is it: Love. In Gaiman’s work (I’m thinking American Gods, Anansi Boys, and the Sandman comics) he’ll definitely put his people through the ringer, sometimes through absolutely horrific experiences — But behind it all I get this sense of a great and benevolent love for people themselves. And, you know, I’m having a very hard time identifying how exactly he accomplishes this. As unpleasant a person as Prester John is (early on), I’m ready to love him, because all the people around him will(remember, we have, quite early on, the scene of his funeral, where everyone mourned). And I already love Hiob (I loved him from the first sentence), and Hagia. And Imtithal — what’s not to love there? She’s made of love. But this goes beyond specific characters. I get the sense that behind it all, Valente has this great love of people, and the world, and a great joy in witnessing all the permutations of world and people. I wish I knew how Valente and Gaiman and Carroll manage to get that across. Carroll, as a matter of fact will absolutely shred his characters… and yet, and yet, there’s all that love. You get it across by not getting it across. By not doing anything. You get it across by being that way yourself, and just writing your story. And it comes across, all by itself. Apropos of reviews of Valente’s work, check out what she said on her blog about phrases overused by reviewers. Love… in a more obvious way, that’s what Dr. Who does, too. He’s always going on about what fantastic creatures we humans are. That’s TV, so it can’t be subtle, of course. Now that I’m finished with the book, I’m trying to make out what the theme is. I do that with books I really enjoy, so I can get as much pleasure out of them as possible. Hagia keeps intimating that bad things are going to happen because of John. Yet, as you reminded me, the funeral was a big to-do. So if the theme is about religion corrupting a functioning society, that doesn’t match up. Maybe the theme is about the power of myth, or the relation between myth and reality? I’m still thinking…. I find it interesting that in Hiob’s time, he hasn’t met any of the non-human people. Apparently everyone’s human. So where have they gone? The trees are still sprouting things like books, so the magic or whatever is still there. There are also hints in Hagia’s writing that humans are coming to their lands and that will change things big-time. What is that about? Armies, pilgrims, or both? Ha, we bring the Doctor into the conversation? But what you say is true… and interestingly (to me), Torchwood (the Dr. Who spin-off) does not seem to have that at all. Whenever I watch it, I see mean people being mean to each other because people are just mean. I can only agree and add that, for me, reading Valente is like eating. Slowly. One glorious mouthful at a time. I HAVE to slow down, otherwise I’ll miss something tucked away in a sound, or a rhythm, or an image. So I read every paragraph (sometimes every sentence) three times. Once to “meet” the beautiful unknown. Twice to be sure I didn’t miss anything. (I usually do!) And thrice for the sheer joy of it. I’ve read both Mieville and Gaiman and find Catherynne’s work infinitely superior. And I LIKE Mieville and Gaiman! Her handling of mythological themes in “The Orphan’s Tales” and “In The Cities Of Coin And Spice” is simply mind-blowing. There are many things I enjoy about good writing. What is most enjoyable to me, is exactly what I enjoy about Valente’s writing, namely, it opens up new ways inside of me to experience the REAL world and people. New ways of paying attention. Will return with more loot after my next foray! Back when I was writing my first novel, I had a discussion with an editor (who shall remain nameless, except to say that she is not my editor), who was holding forth on the virtues of “invisible prose.” The last thing she wanted from writers, she told me, was anything that made the reader stop, for any reason at all. And I couldn’t believe I was hearing this! Why not? Why not be stopped in your tracks by beauty? Isn’t that what happens in real life? And aren’t we glad when it happens? I can only think that she hadn’t encountered truly beautiful prose, only pretentious attempts at flowery language. Or only overblown prose that says nothing but how clever the author thinks s/he is. Or even, perhaps, beautiful prose when it wasn’t the right moment for beautiful prose (there are times when the story doesn’t want or need it). Sure, sometimes you just want to get lost in a ripping good yarn! But to require every story to be nothing other than a ripping good yarn makes no sense. If you want invisible prose, why not eliminate the prose altogether — go watch TV! But I think that’s the issue with that editor. She wanted the TV watchers to read her books. I thought that Prester John and Hiob were okay characters. What I did not like was Hagia, and that was not because of her grotesque appearance. She is whiny and self-condemning;she thinks she is not a good writer but in actuality she is. I really liked Imtithal. Rosemary on Did I not mention? Rosemar on Did I not mention? Jan Dreske on Did I not mention? Terry on Did I not mention?